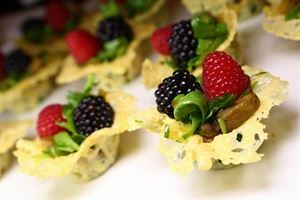 Cool Bites Catering is a premiere professional catering service based in Los Angeles, CA offering fabulous food and fantastic presentation! Here at Cool Bites, we take the time and personalize each catering experience to your specific needs, along with our professional advice and service. We offer delicious and elegant appetizers, salads, entrees and desserts. Our talented chef Anita Aykazyan has a gift for original and fresh ideas, that will leave your guests impressed and wanting more. We provide unique hors d’oeuvres and/or complete formal sit-down diners that are not only delicious to the mouth, but also to the eye, leaving you with a one-of-a-kind exquisite experience. Our full service catering staff would love to help you plan your next occasion, from intimate dinner to private parties. At Cool Bites Catering we take pride in making you feel satisfied and comfortable. Contact us today, so we can begin creating your next event! Cool Bites Catering was such an important part of our wedding celebration, I really and truly believe they're the best at what they do. The food was absolutely fantastic, it tasted as good as it looks on a pictures. This catering is for you If you're looking into something unique and memorable. You can tell right away that Anita and Sophie are in love with what they do. After seven months my guests are still talking about how amazing the food was. Couldn't say enough great things about them. Hire them, brides! You will be super happy you did!